MFLX has a market cap of $693M. Despite the nice pop in the stock price as exhibited in the chart above, the stock is still quite reasonably priced: the PEG is only 0.66, way down in value stock range. Similarly, Price-to-Sales is a mere 0.88. The chart below shows revenue, net income and net margin over the last five quarters. This chart allows us to see the year-over-year change. Yes, revenues have taken a hit but net income has actually registered a nice increase y-o-y. Sequentially, net income has rebounded from a low in the March quarter of this year though it has been essentially flat for the last two quarters. MFLX is cash flow positive and has practically no debt. The company has a trailing PE of 15 and a forward PE of less than 12. For a tech stock in growth mode, these PE numbers are quite reasonable, some would say cheap. Back in November the company announced that for the first quarter of 2010, it expects net sales to range between $225 and $240 million. According to Reuters Estimates, analysts on average were expecting the company to report revenue of $223 million for the same period. This would exceed the highest revenue the company has reported in the last 10 quarters. MFLX benefits from concentrating on a niche: flexible circuit boards. In contrast, the company's much larger and more well-known competitors, Jabil Circuit (JBL) and Flextronics (FLEX), are trying to be all things to all customers, doing everything from design to procurement to assembling all kinds of circuit boards and building complete products. In contrast, MFLX concentrates on flexible circuit boards which tend to be in a range of the the smallest and most popular components and products, things like disk drives, digital cameras, MP3 music players, cell phones of all kinds, etc. 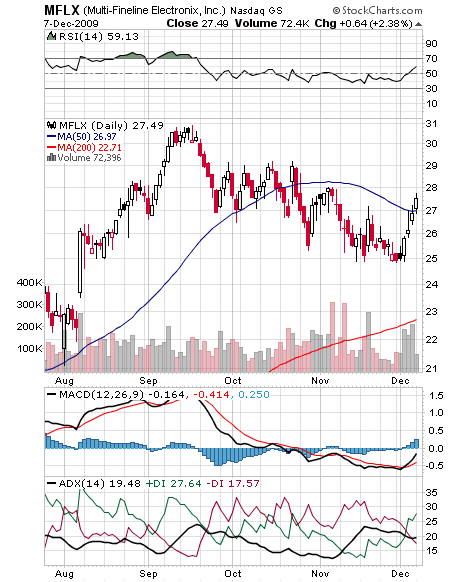 With the holiday shopping season upon us, and indications that electronic gadgets are selling well, MFLX is poised to turn in a good quarter. Whereas semiconductors are first to benefit months before end products are sold, the companies that assemble products tend to benefit much later in the build cycle, essentially just before products are shipped to stores. That timing is what is juicing the company's revenues in its current quarter. As the economy improves, MFLX should continue to do well and continue to benefit from its low cost offshore manufacturing capabilities. The company will also benefit from the continued movement to outsourcing manufacturing and assembly operations. The technicals and the fundamentals are all coming together for MFLX. This is a company you might want to keep an eye on.